5 great reasons to love the MakeUp Eraser: spring 2018 skincare focus. Spring is finally here and that usually means we will all be getting some spring cleaning done pretty soon to start the new season all fresh and focused. Typically a spring clean starts out in our wardrobes, but how about tackling your makeup bag and skincare products this time? Everybody knows it’s not wise to use products past their expiry date anyway, so what better time than now to get rid of all those half-used cleansers and makeup removers and replace them with something that can change your skin cleansing routine forever? Enter the MakeUp Eraser. If you haven’t already seen or heard about this little piece of fabric magic then where have you been? This product is revolutionizing cleansing routines the world over and in this post, we are going to give you some great reasons to love it and get one for yourself. The MakeUp Eraser removes 100% of makeup while gently exfoliating the skin. Yes, that’s right. This silky soft reusable cloth not only easily removes 100% of your makeup including waterproof makeup and mascara but also acts as a gentle exfoliator eliminating the need to use not only a cleansing product but also a separate exfoliation product. The MakeUp Eraser is kind to your skin, even the most sensitive. The Makeup Eraser is so brilliant at its job that no extra chemicals or soaps are needed to clean the day away. It is Suitable for all skin types, even the most sensitive of skins. All you need is warm water to remove even the toughest waterproof makeup in an instant. This is fantastic news for those of us with very sensitive skins that can sometimes react badly to unknown chemicals in cleansing products. It can even clean your makeup brushes (We love this one). All you need is warm water then simply cleanse off all the excess makeup hiding in your brushes using the soft cloth. Your beautiful brushes will be clean and ready to go in no time. You will be saving money and the environment when using the Makeup Eraser. Did you know that the use of the MakeUp Eraser has already saved landfills of 1 billion makeup wipes? That is incredible, isn’t it? 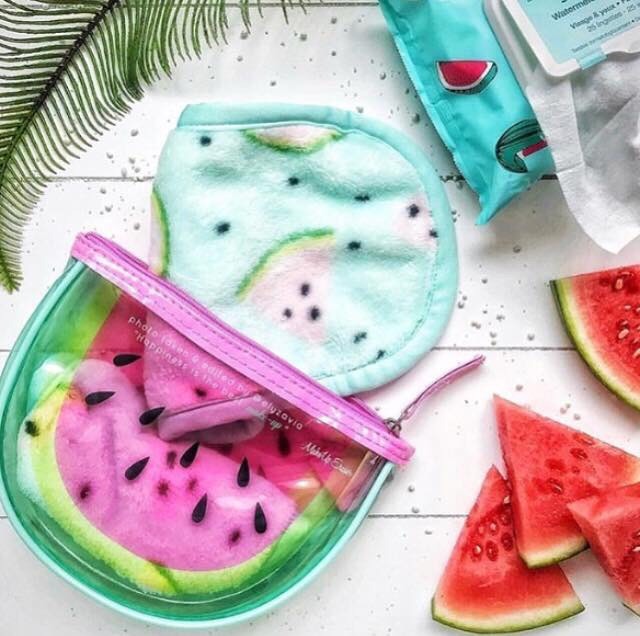 This little reusable cloth can be washed around 1000 times which equals roughly 3 to 5 years and in that time you won’t need to buy a single disposable wipe again. One of the biggest reasons, of course, is that using the MakeUp Eraser will save you endless amounts of money on skincare cleansing products each month. Let’s do the math: R345.00 to get your very own little magic cloth over a period of 3 years using only water, works out to just a little short of R10 a month to cleanse your face each day. What more could you ask for? It comes in a variety of colours and fun designs and no bunnies were hurt making them. It doesn’t matter if you prefer it in the original pink, black or violet or if you feel like some fresh fun with the cute Watermelon, Tropical or Flamingo in their cute little bags, you will find a MakeUp Eraser you love. Why not get two and use them as the mood takes you. Other great things to remember is that the MakeUp eraser is fully machine washable, 100% Vegan and cruelty-free. Face it (No pun intended), you need a MakeUp Eraser in your life. There are so many benefits and your skin is going to thank you for it. Think of the whole new wardrobe you could buy with all the money you will be saving on Cleansing products? If you loved reading this post and want to tell your friends about it, why not share it using the icons to the left. You can also come and join in our fantastic conversations on our Social Media pages, we’d love to have you over. You can find us on Facebook and Instagram so head over, don’t be shy.